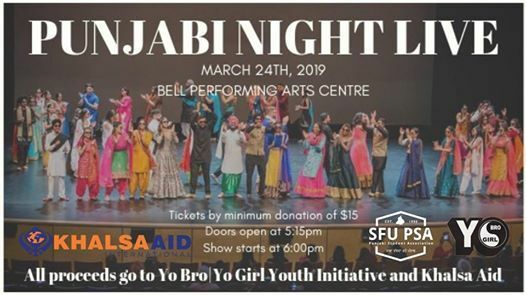 SFU PUNJABI STUDENTS ASSOCIATION presents Punjabi Night Live 2019!!! 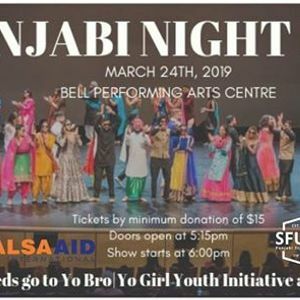 Punjabi Night Live 2019 will be taking place at The Surrey Bell Centre on March 24th. Our goal is to promote Punjabi culture in a family friendly environment while raising funds for deserving causes. The night will be filled with events such as skits, fashion show, a performance by SFU's Bhangra Club, and much more. We will be giving out FREE door prizes and there will also be raffle giveaways! All proceeds from this event will be donated to the Yo Bro Yo Girl Youth Initiative and Khalsa Aid. Yo Bro Yo Girl Youth Initiative is an outreach program for youth at-risk of involvement in drugs, violence and gangs. Yo Bro Yo Girl has developed a range of impactful, life-changing programs delivered in the classroom, out of school, and during school breaks. The programs reach boys (Yo Bro) and girls (Yo Girl), aged 12 to 18 years, and allow older program participants to play a mentorship role. Come join us for a night of laughs and entertainment while supporting these charities. We hope to see everyone there!! Follow @sfupsa on Instagram or Like our Facebook page SFU Punjabi Students Association for information about PNL 2019 and other upcoming events.